Being safe on the road with runners reflective wear is easy to do and helps to prevent unwanted accidents from occurring. Today there are fashions for both sexes that have reflective qualities about them to increase the level of safety of those that wear them when they are out exercising or just on a leisurely stroll around the neighborhood. 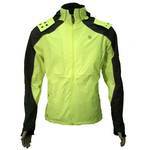 Th e most commonly worn piece of clothing with reflective characteristics is the jacket or vest. There are both women' s and men' s style to chose from. The reason they increase the level of safety for the wearer is the application of 3M Scotchlite retro-reflectivity that is placed on the material of the apparel. The way the 3M Scotchlite retro-reflectivity works is by reflecting the light that hits it back to its source. It is the amount that is returned which is a measurement of its reflectivity. It is measured in candle power or cd/lux/m squared. For a comparison a white item of clothing has a reflectivity of 0.1 to 0.3 cd/lux/m squared. Most people think that a license plate is highly reflective and can be seen from a great distance as they wear designed to be. Their reflectivity rating is 50 cd/lux/m squared. Apparel with 3M Scotchlite retro-reflectivity has a reflectivity rating of up to 500 cd/lux/m squared.This makes it possible for a person who is wearing apparel with this material to be seen by others up to 160 meters or 174.3 yards away when there is a light source like a headlight of a vehicle. The way the light is scattered upon being reflected is dependent upon the distance of the light source from the person wearing the apparel. The observed deflection of the light from the light source is between 0.2% and 0.33%. The performance of the reflective properties of this material exceeds ANSI/ISEA 107-2004 and CAN/CSA Z96-02 minimum coefficient for reflectivity of the level 2 in the category of retro-reflectivity material. It is the performance of this materials ability to reflect light back at the light source that makes it the preferred material to be worn by people out at night such as runners. By increasing the visibility of the person who is wearing apparel with of 3M Scotchlite retro-reflectivity material, the chances of not bein g seen and hit by a vehicle are significantly reduced. Items with this material include vests and jackets along with shirts, pants gloves and hats. There is also the illuminate reflective material. This material incorporates very small glass beads into material so it has reflective qualities. The Illumnite material has met the testing procedures for their competitors product the DuPont Cordura and has been certified as part of the Cordura branding program for its reflective qualities. Both materials allow for the person wearing them to be more visible to others at night. This is the best way to be seen when the light source is diminished so accidents can be prevented. The most commonly worn piece of clothing with reflective characteristics is the jacket or vest. There are both women’s and men’s style to chose from. The reason they increase the level of safety for the wearer is the application of 3M Scotch lite retro reflectivity that is placed on the material of the apparel. The way the 3M Scotchlite retro reflectivity works is by reflecting the light that hits it back to its source. It is the amount that is returned which is a measurement of its reflectivity. It is measured in candle power or cd/lux/m squared. For a comparison a white item of clothing has a reflectivity of 0.1 to 0.3 cd/lux/m squared. Most people think that a license plate is highly reflective and can be seen from a great distance as they wear designed to be. Their reflectivity rating is 50 cd/lux/m squared. Apparel with 3M Scotchlite retro reflectivity has a reflectivity rating of up to 500 cd/lux/m squared. This makes it possible for a person who is wearing apparel with this material to be seen by others up to 160 meters or 174.3 yards away when there is a light source like a headlight of a vehicle. The way the light is scattered upon being reflected is dependent upon the distance of the light source from the person wearing the apparel. The observed deflection of the light from the light source is between 0.2% and 0.33%. The performance of the reflective properties of this material exceeds ANSI/ISEA 107-2004 and CAN/CSA Z96-02 minimum coefficient for reflectivity of the level 2 in the category of retro reflectivity material. It is the performance of this materials ability to reflect light back at the light source that makes it the preferred material to be worn by people out at night such as runners. By increasing the visibility of the person who is wearing apparel with of 3M Scotchlite retro reflectivity material, the chances of not being seen and hit by a vehicle are significantly reduced. Items with this material include vests and jackets along with shirts, pants gloves and hats. There is also the illuminate reflective material. This material incorporates very small glass beads into material so it has reflective qualities. The Illumnite material has met the testing procedures for their competitor’s product the DuPont Cordura and has been certified as part of the Cordura branding program for its reflective qualities.